Yesterday, Chunklet Industries and Third Uncle shared the split 7″ they are putting out featuring Air-Sea Dolphin and Sloshy via NPR. Along with the ASD track “Bells (Song For Geoff W)“, the band shared a video game created by Matt and Mike Chapman (Homestar Runner) and programmed by Schneider’s 17-year-old son, Max Schneider. 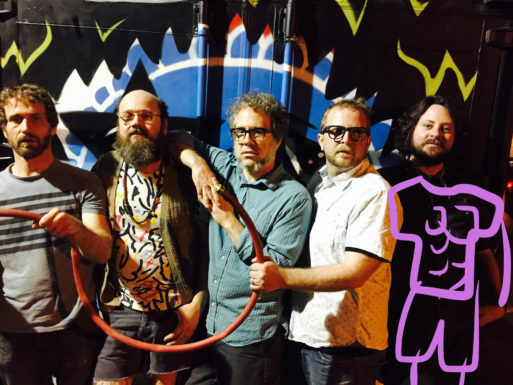 When Robert Schneider, leader of The Apples in Stereo and co-founder of the Elephant 6 Recording Co., moved to Atlanta to pursue his PhD in Mathematics five years ago, who could’ve predicted that he’d start a new band as well? Air-Sea Dolphin is the combo of guitarist Matt Chapman and bassist Mike Chapman (a.k.a. the Brothers Chaps from Homestar Runner), guitarist Ryan Sterritt and drummer Jamey Huggins (Of Montreal, Elfpower, Great Lakes), with Schneider singing and writing most of the songs. The band plays only very rarely in the Atlanta-Athens area, including an appearance on Adult Swim’s Bloodfeast, but their geeky obsessions flourish inside ASD’s micro-universe: four-tracks, fuzz-tones, an Atari-based synthesizer, and even a series of retro arcade games to serve as music videos. Not to mention Air-Sea Dolphin makes wistful, lo-fi pop so catchy it will make your mind explode. Sloshy is the “indie rock joke band” from Homestar Runner. This marks their first release ever.